Oh no, oh no, oh no: it’s finally happening. Ann Perkins and Chris Traeger are set to leave Pawnee, Indiana and they finally will on Thursday, January 30th. And we’ve got the picture from the appropriately titled Parks and Recreation episode, “Ann and Chris” to prove it. Sigh, OK. Chin up, kids: this one’s going to be tough. Tear towels at the ready, folks. The episode will follow Leslie Knope as she finally says the long-anticipated and totally unwanted goodbye to her best friend Ann Perkins as she heads on her way to scenic Michigan. But the last episode for actors Rashida Jones and Rob Lowe won’t just focus on what is arguably one of the best female friendships on television, it will also find Ben Wyatt getting in touch with his own emotions as he says goodbye to Chris Traeger after years of auditing Indiana towns together. The whole affair will center around a huge, over-the-top, completely Leslie Knopeified going away party, and the boys’ — Tom, Ron, and Andy — quest to find literally the perfect going away present for their buddy Chris. There are several additional photos from the episode over at E!, but we thought to spare you the emotional turmoil of looking at photos that might make you laugh instead of simply feel the cries, so we’ve compiled only the most tear-inducing photos of them all, and ranked them on a scale of tear-induction possibility. They’re all pretty high up there, fair warning, so make sure you’re prepared going in, OK? Let’s start this off slowly. 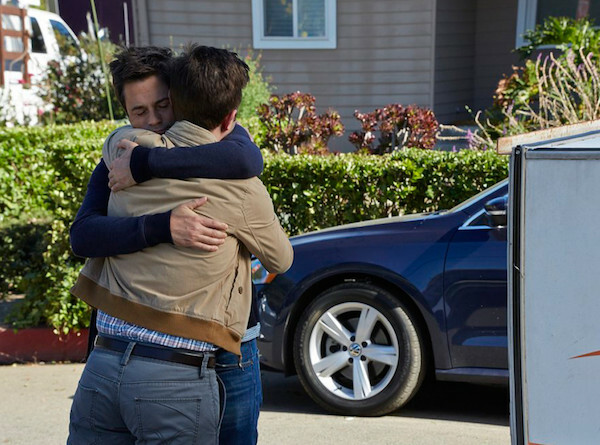 No, no, no, no, no, no: I can’t deal when two dudes hug in an emotion-filled manner. I can’t! They’re leaving! They’re leaving! Noooooooooooo. Defcon 1: ABORT MISSION, ABORT! I can’t do this. It’s just too hard. Even goddamn Larry’s got me a sobbing mess. Damnit, Larry! 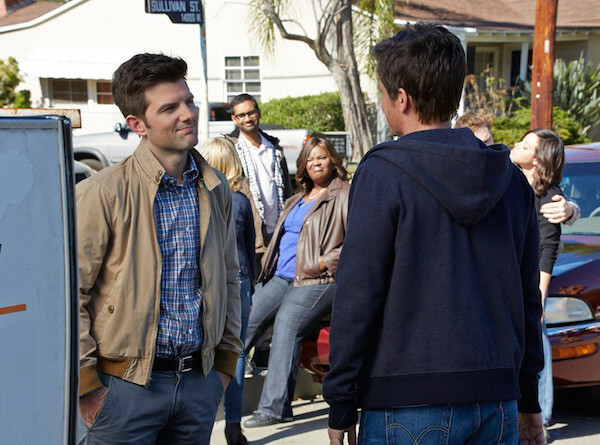 Parks and Recreation’s farewell to “Ann and Chris” airs Thursday, January 30th on NBC.